Wonderful West Town! For a youthful, eclectic vibe, West Town is where it's at! New home of corporate giants, Google and McDonalds, West Town is unassuming and diverse. This lovely two bedroom, two full bath condo is located on a leafy street just steps away from shopping and restaurants. The living space is bright and airy with a Juliette balcony, hardwood floors and a wood burning fireplace. The kitchen has granite counter tops, stainless steel appliances and a breakfast bar/island for casual dining as well as good table space. The large master bedroom adjoins a full master bath with separate shower, whirlpool and double sink vanity. The large rear deck has a wonderful skyline view & garage parking & private storage locker are included. 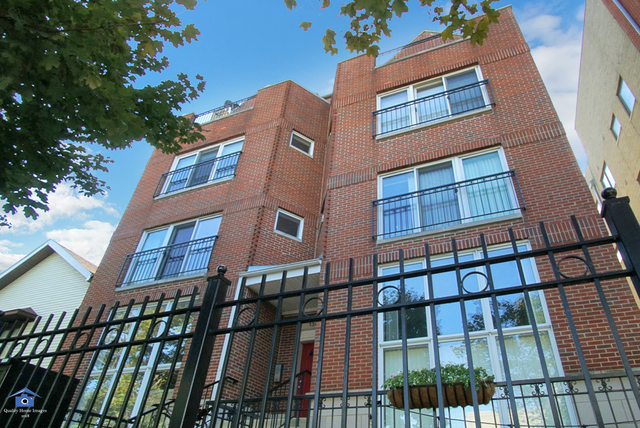 Low assessments make this condo a great value. New carpet & paint in common hallway. Walk to blue, green & pink line el trains. Special lender incentive of $1290 closing cost credit available. Seller has applied for HO tax exemption.